DOVER-FOXCROFT — The Center Theatre, Slightly Off-Center Players, and members of the Barony of Endewearde are presenting a Medieval Dinner Theater at 7 p.m. on Saturday, March 31, at the Commons Event Center on the second floor of the newly renovated Central Hall building in downtown Dover-Foxcroft. The grand opening for the space won’t be until May 12, but Patrick Myers, executive director of Center Theatre, said this will be the first public event in the space. “Not quite everything will be finished, but people will be delighted with all the great work that the Maine Highlands Senior Center has done to make the space available to the community,” he said in a press release. The Center Theatre has entered into an agreement to manage the event center for the Maine Highlands Senior Center and is booking reservations for weddings, receptions, parties and other events. The Medieval Dinner Theater, titled “The Ring of Lies,” promises to be a hilarious night filled with good food and entertainment. 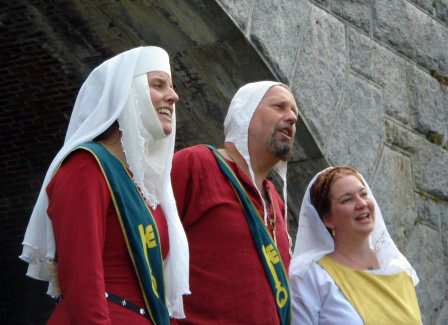 “We’re thrilled to have the support of Members of the Barony of Endewearde. They are part of a large group of medieval enthusiasts around the country and will be at the event to provide authentic music as well as some other surprises. Medieval food will be provided by Spring Creek BBQ, and members of the Slightly Off-Center Players will be performing. While not required, we certainly hope some of the audience will be coming in costumes to get into the spirit of the night,” said Myers. Tickets are on sale at the Center Theatre box office, online at www.CenterTheatre.org, and by calling the Theatre at 564-8943. Tickets are $35 per person, or $150 per table of six. Seating is limited so advance reservations are essential. The Center Theatre is a 501(c)3 non-profit with a mission of making the arts a part of life in the Maine Highlands by offering affordable arts, culture, education and entertainment.